TERRE HAUTE—The grounds and buildings of the Monastery of St. Joseph today exude the quiet solitude of the prayerful way of life of the small group of Discalced Carmelite nuns who have lived there for nearly 70 years. But just about 15 years before the Carmelites came to their original home on the south end of Terre Haute in 1947, part of the building had been used as a Prohibition-era speakeasy and dance hall. “It just wasn’t the environment that’s necessary for a life of prayer and solitude,” she said. The current monastery was constructed during the 1960s through the help of generous donors, who came to know the community of contemplative nuns in its first decade of life in Terre Haute. Since the women’s branch of the Discalced Carmelite was founded in Spain nearly 500 years ago by St. Teresa of Avila, the order has been dedicated to maintaining small communities. When one grows to have more than 21 members, it has to start another monastery. The Monastery of St. Joseph was founded by the Discalced Carmelite nuns of the Monastery of the Resurrection, which was located in Indianapolis until 2008. At that time, that community relocated to the grounds of the Congregation of the Sisters of the Third Order of St. Francis in Oldenburg. For its part, the Carmelite nuns in Terre Haute have founded one community in its history—a Carmelite monastery in Des Plaines, Ill. In the years leading up to the founding of the Monastery of St. Joseph, Mother Anne Brackman said that Archbishop Joseph E. Ritter, who led the Archdiocese of Indianapolis from 1934-44, saw a need for the witness of Carmelite nuns in Terre Haute because mafia figures from Chicago came there and were involved in prostitution and illegal gambling. Today, the 14 nuns at the Monastery of St. Joseph, many of whom were born in countries around the world, are a witness to the universality of the Christian life and the call to contemplative prayer. “They knew what suffering was about,” Mother Anne said. Discalced Carmelite Sister Mary Joseph Nguyen, 45, knew such trials as she grew up in war-torn Vietnam. Members of her Catholic family fled the communist country as part of the “Boat People,” who suffered hardships on the high seas and in refugee camps in many southeast Asian countries from the late 1970s through the mid-1990s. She and other family members remained in Vietnam, and were eventually able to immigrate to the United States through a sponsorship program. Sister Mary Joseph appreciates sharing her vocation with other nuns from the United States, South Korea, Trinidad and Tobago and the United Kingdom. Discalced Carmelite Sister Martha Hall, who joined the Monastery of St. Joseph in 1960, has appreciated how the makeup of the community has changed over the years. This intimate life shared by women from so many different cultural backgrounds, Sister Martha said, is an example for the rest of the world. The Monastery of St. Joseph has also in recent years attracted more young professional women to its life of prayer. Mother Anne noted that some of its younger members have college degrees in engineering, zoology, computer science and library science. Many of the newer members of the community learned about it through its website, www.hearstawake.org. The website has also enhanced the community’s life of prayer. 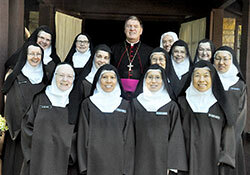 About 20 requests for prayer a day from all over the world come to the nuns through their website. Although the community makes use of the Internet to promote vocations and reach out in prayer to people around the world, Mother Anne recognizes the pitfalls that come with being too involved online. No one in the community, for example, has accounts for social media platforms like Facebook or Twitter. And in that communion, the nuns constantly offer up prayers for the Church in central and southern Indiana and around the world. Mother Anne foresees the life of prayer that is at the heart of the Monastery of St. Joseph—today and has been so since 1947—continuing into the future.